Support Snaps for the first time! Implement a more robust queuing system. Fetch our curated collection from an external database. This will be securely downloaded and cached on your computer, as opposed to being stored within the package itself... so that means updates to apps will happen much quicker. Support theming, so it'll adapt colours of your current theme. Offer the ability to search the archive and snaps. Add a feature for community members to leave reviews/comments. They'll be posted here, in the community! In future, we're thinking of expanding to web apps, and present a nice selection of themes. It's not ready for prime time yet, but we hope to have it ready and surpass the current Software Boutique by the end of the 17.10 18.04 cycle. In other news, myself and Martin (@Wimpy) met offline for the very first time at the Ubuntu Snappy Sprint in Canonical's offices. 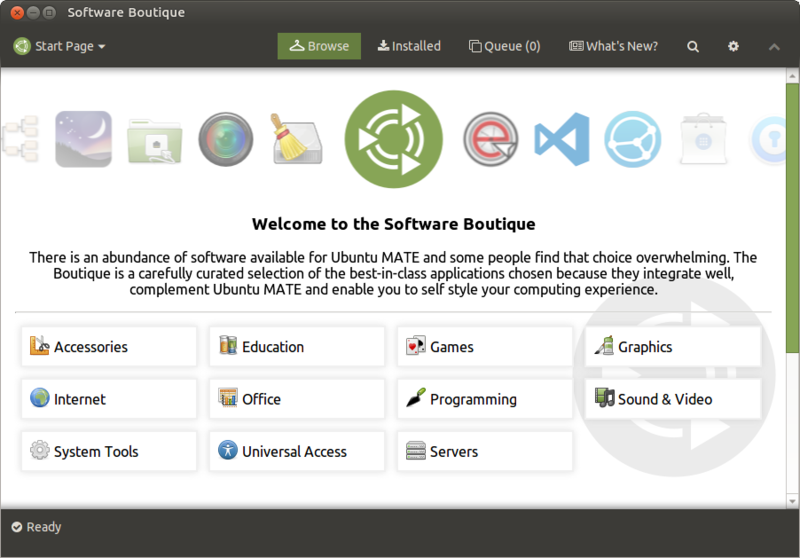 Great news, for a great and defining software of the Ubuntu MATE distribution, @lah7. If the Welcome Screen is the king, the Software Boutique is the crown that sits on its head. Hopefully with some support for changing sources. Meh! It’s been my experience that user comments and reviews are, generally speaking, the poorest and least credible source of information. But it is also my experience that people usually call me a cynical old b.astard. Right! This is absolutely spectacular news! I found the early implementations of the boutique to be brilliant and wondered if one day it might just grow into a standalone software center for UM but also realized that it might be a bit greedy to ask for such a thing considering how much work it would undoubtedly entail. Seeing it progress this far so quickly is quite remarkable and yet another testament to the relentless and uncompromising approach the UM team has taken to forge this distro into a true standout amongst it’s peers. My hat is off to you all, excellent work and I can’t wait to give it a spin. 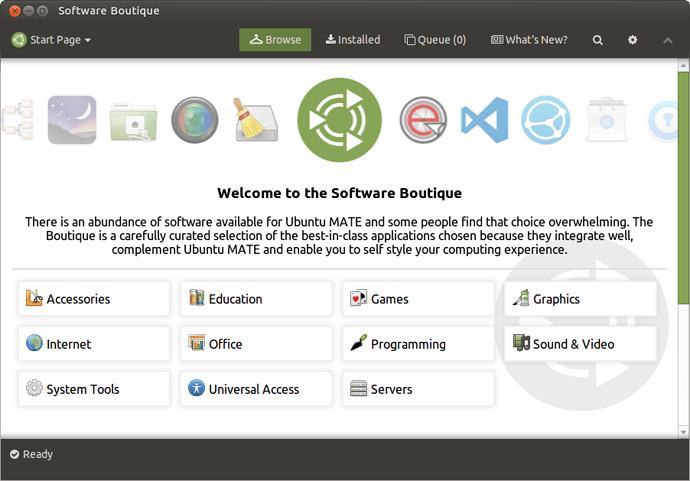 Thank you lah7 for the work you put into Ubuntu-Mate. The implementations and resources are very interesting! Support theming, so it’ll adapt colours of your current theme. Thank you! I tend to use the Radiant theme and the top bar content goes “invisible”. A new type of package format for Ubuntu that has some advantages over traditional deb packages, such as making it easier the get the latest version of apps directly from apps’ developers. Just an update to this – a lot of focus in the 17.10 has been on polishing the desktop experience – fixing bugs, being stable and @wimpy solving technical challenges along the way. This means that Welcome and the “new” Software Boutique hasn’t had too much focus in this cycle as originally planned, but these new features are definitely coming for 18.04 LTS, so hang tight! Started Virutual Box and I noticed a little odd behaviour, when the categories selection is open it stays on top and I have to go back to Browse to close it. No idea why is libva complaining. This new Software Boutique is still in development and hasn’t been released yet, consider it pre-alpha at this time of writing. But thanks for spotting that – little things like this will be addressed as much as possible before final release. Yes, I saw the source it looks like pre-alpha. I wanted to see if I can make thelayer between the header and footer slightly transparent. I was able to set the window’s and webkit2.webview’s opacity in the backend but didn’t figure out how to set it in the frontend. That CSS in ‘sources/boutique.less’ is tricky.